The latest edition of ALEC’s Rich States, Poor States was released on April 15, 2019. The centerpiece is the Economic Outlook Ranking, which is ALEC’s scoring of states on 15 measures reflecting ALEC’s preferred policies towards business. The flawed methodology remains unchanged from previous editions. The index purports to predict which state economies will perform the best, but in fact analyses of previous versions have shown there is no relation between a state’s score and how fast the economy grows subsequently. Since the first edition in 2007, it has remained the case that ALEC’s “best” states — the ones with the highest rankings — are actually poorer on several measures than the supposedly “worst” states. In fact, four states noted for their liberal politics who find themselves perennially among the worst 10 states in the ALEC economic outlook rankings — New York, Washington, Oregon, and California — actually were among the top 10 states on two key measures that ALEC uses to measure performance in the latest edition: growth in state gross domestic product and growth in non-farm payroll. Read more.. The State Business Tax Climate Index purports to measure a state’s “tax competitiveness” but previous iterations of the index bear very little relationship to what businesses actually pay in taxes in one state versus another. There is no reason to expect that the new index does any better. Read more. Scoring well on the SBTCI does not mean a state will experience more growth; the Tax Foundation provides no evidence that their index actually predicts growth and research has generally found that it does not. Read more. The 2019 edition incorporates a number of changes in how particular taxes are treated in the index. They assigned more weight to favorable provisions regarding the expensing of capital equipment, modified the scoring of loss carryforwards to reflect changes in Federal law, included new payroll taxes in Oregon and Nevada, and changed the weights applied to a few tax features and to the five main sub-indexes. These changes in methodology could affect the scores and rankings of particular states, even if those states made no changes in tax policy, but none of the changes address the fundamental problems with the Tax Foundation’s index. For ALEC and other advocates of income tax cutting, Kansas was to be the poster child. Governor Sam Brownback signed legislation in 2012 slashing income taxes, a move that was supposed to provide an “immediate and lasting boost” to the economy. In June of 2017, this drastic social experiment came to an end. The Kansas legislature overrode the Governor’s veto and enacted a bill to roll back most of the tax cuts. The experiment failed in part because the tax cuts did not produce the promised boost to the state’s economy. The state of Kansas had not been a laggard before the cuts. From 2001 through 2012, the state had actually grown faster than the U.S. as a whole. But for the four years since the tax cuts took effect, the Kansas economy has grown at just half the rate of the U.S. economy. For an updated and detailed discussion, see The Lessons of Kansas. A remarkable database on state business taxes and incentives over the past 26 years was recently made available by the Upjohn Institute for Employment Research. Timothy Bartik, a leading national expert on business incentives, is the author of a report describing the results of his analysis of the data: A New Panel Database on Business Incentives for Economic Development Offered by State and Local Governments in the United States. His analysis drives another nail in the coffin of the claim, often argued but never supported, that incentives will pay for themselves. The data measures the value of state and local incentives, as well as the cost of state and local taxes, through a representative firm model. For each of 45 industries, a firm representative of that industry is created, and the model determines how much that firm would pay in taxes and gain from incentives if the firm located a new establishment in a particular city. The model includes state corporate income and sales taxes, and local property taxes, in 47 cities in 33 states. The 33 states account for 92 percent of national GDP. Incentives include job and investment tax credits, R&D credits, customized job training, and property tax abatements. It covers tax laws and incentive programs each year in each location from 1990 through 2015. The total spent on business incentives by state and local governments across the U.S. is estimated at $45 billion in 2015. 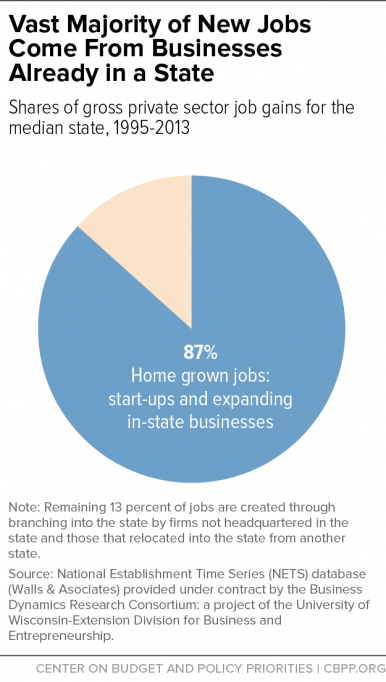 The average incentive package amounts to about 30 percent of state and local business taxes. Incentives more than tripled from 1990 through 2015, though a large part of that growth occurred in the 1990s, with incentive growth slowing since then. Incentives persist through good times and bad, and don’t seem to be higher in states with weaker economies. Incentives generally are not well targeted at the types of businesses that create the most jobs, or the highest paying jobs. There is considerable room for reform of incentives that would reduce costs substantially. The database is particularly valuable for research purposes, because the effects of incentives on growth can be measured both as differences across places at a point in time, and as differences within a state or city over a long time period. Do cities with higher incentives or lower taxes, compared to other cities, and compared to their own history, experience more growth? The model allowed Bartik to analyze separately the effects of a state’s gross taxes (before incentives), the effects of the incentive package, and the effect of net taxes (gross taxes less incentives) for a particular industry, on state economic growth. He analyzed both the state average rates, and the rates specific to each export industry. His statistical analysis found that theses tax and incentive variables always were statistically insignificant. In other words, the strength of the relationship between the tax variables and growth was so weak that he could not rule out that it was caused by chance. Moreover, the maximum effect of taxes in reducing growth, or incentives in increasing growth, was toward the lower end of the range of possible effectiveness that had emerged as a consensus through previous research. It should be noted that most of the previous research did not have the quality of data that is contained in this database: effective tax rates on new investment for particular industries over a substantial time period, covering most export sectors (the ones most “footloose”). It is such effective tax rates, not the average taxes on established businesses that have been used in most studies, that should affect business location and investment decisions, and hence state growth. No doubt additional research, taking into account additional factors such as variability across states in the level of public services or wage rates, will be conducted by Bartik and other researchers using this public database. But Bartik’s preliminary analysis confirms our conclusion: state and local business taxes are too small a share of business costs to affect most location and investment decisions. The vast majority of jobs created in firms that receive incentives would have been created at that location anyway, because of other considerations more important to the firm’s decision. If only one firm out of every 20 granted incentives was actually influenced by the incentive, as appears likely given Bartik’s statistical analysis and the average incentive package, then incentive strategies are very costly indeed. A new report sheds light on the debate about whether high state taxes cause millionaires to flee to low-tax states.1 The conclusion: With the possible exception of Florida, taxes seem to have no effect on the migration decisions of the rich. In the words of the authors: “[O]utside of Florida, differences in tax rates between states have no effect on elite migration. Other low-tax states, such as Texas, Tennessee, and New Hampshire, do not draw away millionaires from high-tax states.” As for Florida, “It is difficult to know whether the Florida effect is driven by tax avoidance, unique geography, or some especially appealing combination of the two.” The authors conclude that taxes on the rich could be raised substantially and the result would be a substantial increase in revenue, not a loss. The Urban Institute’s Howard Gleckman has provided a summary of the research. 1 “Millionaire Migration and Taxation of the Elite.” Young, Cristobal; Varner, Charles; Lurie, Ithai Z.; Prisinzano, Richard. American Sociological Review. June 2016, Vol. 81 Issue 3, pp. 421-446. Once again ALEC is pushing their discredited notion that tax cuts are a potent tool to promote state economic growth. While the preponderance of serious research indicates that cuts to a state’s income tax or its business taxes have little positive effect on a state’s economy, and may well prove harmful to the long term prospects for growth and for increased prosperity, ALEC continues to push their anti-tax anti-government agenda. The latest effort is their State Tax Cut Roundup for the 2015 legislative session. The recent experience of Kansas should be caution enough against tax cutting as economic policy. For advocates of income tax cutting, Kansas was to be the poster child. Governor Sam Brownback signed legislation in 2012 slashing income taxes and cutting the state budget by over 13 percent. The tax cuts had been pushed by Stephen Moore and by Arthur Laffer, author of ALEC’s Rich States, Poor States, who argued they would provide an “immediate and lasting boost” to the economy. 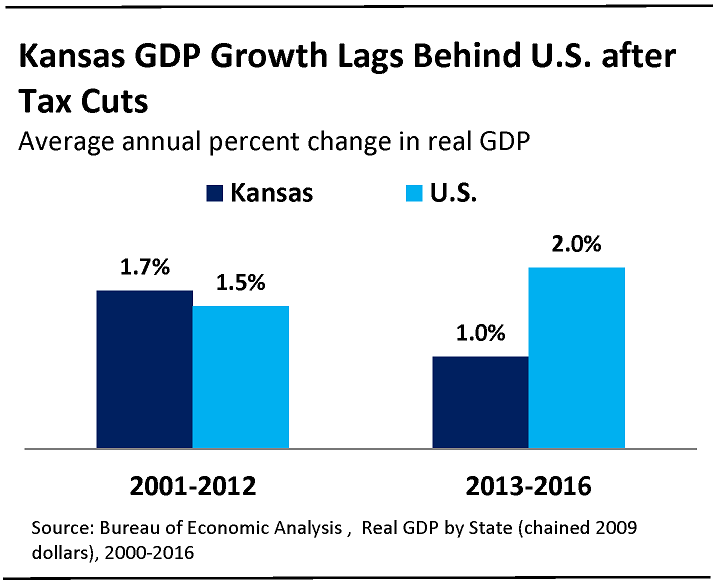 But instead of boosting the economy, Kansas GDP actually declined by 1.1 percent in 2013, the first year of the tax cuts, while nationally GDP grew at 1.3 percent. In 2014, Kansas growth once again lagged the nation, 1.4 percent versus 2.2 percent. Estimates for 2015 show the trend continuing, with state GDP growth expected to be just half of the national rate. Read more. So how do ALEC’s policy prescriptions stack up against the concept of fairness? A state tax system that did not alter the distribution of income, as they supposedly favor, would be a proportional system: it would take the same percentage of income from every income group. However, most state tax systems are regressive: they take a larger percentage of income from lower income groups, because they are dominated by sales, excise and property taxes, and an income tax generally of only modest progressivity. Yet ALEC invariably applauds income tax cuts, which would make a state’s system more regressive, moving the state further from the goal of neutrality with respect to income distribution. Apparently shifting taxes from upper to lower income groups is the fair thing to do according to ALEC.